Thousands of salespeople have sat across from me throughout my career. Some were very good. Most weren’t. Not because they lacked ability, but most lacked what I valued most while leading a company – somebody who really wanted to help me grow my business. Self-interest is what drives far too many salespeople – and others, for that matter. What’s in it for me? That’s our collective battle cry. I’m okay with it provided we help the other person get what might best help them first. Mutual benefit should be the objective. Countless sales executives have entered my office for the first time ever, armed to the teeth with a bag (sometimes literally) of tricks they claimed would solve my problems. It always fascinated me how a complete stranger who had spent no time with me, or my organization could have such a solution. Or how they could even know what my problems might be. Focused entirely on what was in it for them, they began their pitch with all the reasons why this solution was ideal for me. It was left up to me to decipher whether or not they really did have something I could find valuable. That’s a bad strategy for problem solving – no matter if you’re selling a solution or not. Well, actually, even people on the executive team are selling a solution. They’re trying to persuade the organization to accept their idea. The value of their solution isn’t enhanced with a “let me tell you why this is good for me” tactic. Never put the burden on the buyer – whether it’s your boss, a client or somebody else – to figure out if you’ve got something valuable or not. Presenting the value as the buyer would see it isn’t the same as deciding if it’s right for them, or robbing them of the opportunity to decide for themselves. But let’s back up before we even get to the part where you present a solution. First Things First. Ask. Investigate. As a young salesman I read and heard sales trainers use a term that never felt quite right to me. Probe. Probing is what we were taught to do to uncover a customer’s needs, possible objections and anything else that might help us figure out an ideal solution. Not that there’s anything wrong with the term, it just wasn’t a favorite word for me. My natural style was always to simply have an engaging conversation where I asked customers questions. It didn’t take me long to learn that if I could ask the right question, I could find out more about the customer’s desire. That elevated my ability to figure out what I might have to help them. Or it helped me learn I may not have anything that would help them. I would often imagine somebody who requested an appointment just to find out more about our company, or me before knocking my door down with a “here’s exactly what you need” pitch. It never happened. Periodically (not very often), I’d see some sales executive who I thought might be open to hearing such a message, and I’d run the idea past him. Most were just polite, but only a few – very few – appeared genuinely startled at such a novel approach. Startled to the point where I thought they might actually try it. These were the day of the one-call-close. Nothing has changed. People today are aiming for the one-call-close. We’re all busy. Our prospects are busy. We think, “We’ve only got one shot.” That’s not true though. And if it is true, then I want to challenge you to do something more valuable with that one shot. You can stand out more by not putting your need to make a sale – that includes you executives who are trying to sell your boss on your idea – at the forefront. Instead, try to gain a clearer understanding of the problem. You can substitute pain, desire, want, need or anything else in the place of the word “problem.” Find the word that best fits your situation. I spend a few minutes (1-2) telling them why I’m reaching out to them. Don’t play some bait and switch game with your prospects (especially your boss). Be candid. Tell people why you’re wanting to hear their story – why you’d like to ask them questions. It’s not an interrogation. It’s a conversation. Don’t make it a grill session. I then simply ask them to tell me their story. And I shut up. Most open up quickly – evidence they’re not asked this question nearly often enough. We all care about our story. Most of us wish somebody cared enough to ask us about ours. I do care enough. I’m fascinated by the stories I hear. Most days I hear more than one really compelling story. Amazing what you learn simply by asking. Then I briefly tell them the truth. Sometimes what I do – or anything I might offer – isn’t a good fit for me. That means it won’t be a good fit for them. Other times, I’m not sure. But it’s not up to me to make the call when I don’t know on my end. If I’m thinking, “This may be something valuable for him, but I’m not sure” — then I’ll tell them that. I don’t try to make the decision for them. They need to make the call. It leads to more conversation or it doesn’t. Either way, I’m good with that and I’m convinced so are they. We both win regardless of the outcome. I don’t want to sell. And I don’t think selling or sales is a dirty work. I just don’t want to do what most people think of when they think of selling. They think of talking people into things. Manipulation. That’s not what sales is. It is persuasion and influence – which we all want to incorporate into our communication when we know we’ve got something of value…something that can help others. Mostly, it’s giving people an opportunity to solve their problem (remedy the pain, gain some pleasure, get a solution, etc.). No Agenda Except To Give Others An Opportunity. And Give Yourself An Opportunity To Serve. Put first things first. Put your prospect (yes, that means your boss, or perhaps a co-worker, or anybody else you’re trying to serve) first. Listen to them. Better yet, express interest in learning as much as you can about what they think, how they feel and what they want or need. Ask. Listen. Pay attention. People are searching for solutions. Many are staring into space right this minute, wishing somebody would arrive into their life to help them. What if you could be that person? Why can’t you be that person? My headline isn’t completely true. 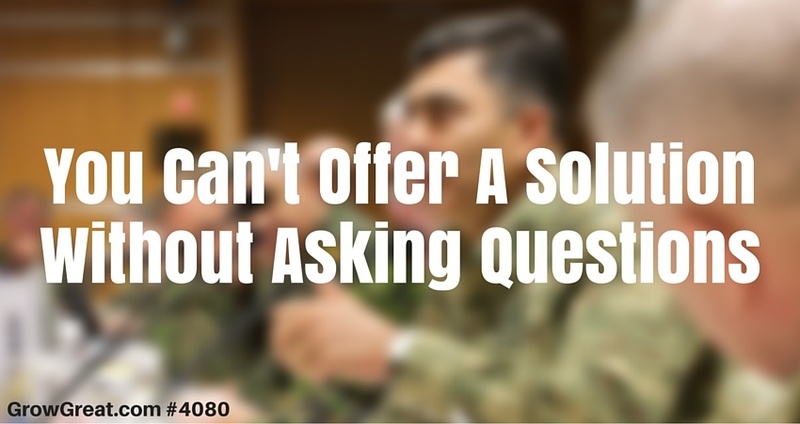 You can offer a solution without asking a question. You can offer a solution without even listening to the other person. It will be a terrible experience for you – and the person you’re hoping to sell. But you can keep doing it. And keep enjoying a life of disinterested people. They’re disinterested in your solution because you’re disinterested in them.